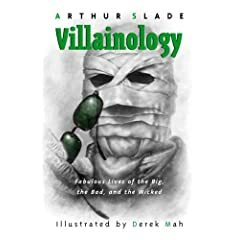 Ok, I've just been to Art Slade's website and you have to check out the trailer for his new book, Villianology: Fabulous Lives of the Big, the Bad and the Wicked. I admit that I haven't read it yet, but if it's anything like Monsterology: Fabulous Lives of the Revolting, and the Undead, you won't be disappointed. Then again, I admit that I'm a big Slade fan in general. I loved Tribes and read Dust in one sitting; I couldn't put it down!